It's a loaded Sunday for MLB DFS players with the action getting underway at 1:05 p.m. ET and extending all the way into the evening with Braves vs. Indians on Sunday Night Baseball. There are plenty of MLB DFS tournaments and cash games for various slates throughout the day such as the $100K Sunday Squeeze on FanDuel or the $200K Walk-Off Home run on DraftKings. 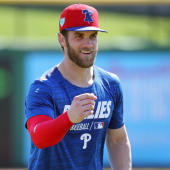 Cody Bellinger, Christian Yelich, Bryce Harper and Nolan Arenado are some of the most expensive hitters for Sunday, while Stephen Strasburg Tyler Glasnow and Noah Syndergaard are among the top pitchers expected to take the mound. And before locking in any MLB DFS lineups for Sunday, first see what Mike McClure has to say. He's a DFS pro with almost $2 million in career winnings and his top MLB DFS picks, optimal lineups and advice can help you navigate all the action on Sunday, April 21. When it comes to MLB, McClure is at his best. Recognized in the book "Fantasy Football (and Baseball) for Smart People: How to Turn Your Hobby into a Fortune" as a top MLB DFS player, McClure rolled through last season, producing multiple lineups that cashed in huge. On Friday, McClure rostered Brewers first baseman Eric Thames at just $2,200 on FanDuel. The result? He went 2-for-4 with a home run, returning 21.7 points and almost 10x value. Anybody who had him on their roster was well on the way to a huge day. Now, he's set his sights on Sunday MLB DFS slates and locked in his picks. Part of his optimal MLB DFS strategy for Sunday includes targeting Rockies outfielder Charlie Blackmon ($3,700 on FanDuel, $5,000 on DraftKings), who has been tearing up Philadelphia pitching this series with three hits, a home run and two RBIs through the first two games. He's hitting .348 with a .609 slugging percentage on the year at Coors Field, so you can confidently lock him in as one of your top MLB DFS picks on Sunday. Another one of the MLB DFS picks McClure loves: Yankees outfielder Mike Tauchman ($2,700 on FanDuel, $4,000 on DraftKings), who enters Sunday red hot. With New York dealing with several key injuries in the outfield, Tauchman is getting more playing time and he hit his third home run in his last four games on Saturday. He gets a favorable matchup against the Royals and starter Jorge Lopez, who has given up six home runs this season, on Sunday. McClure is also targeting a player capable of putting up massive numbers who has a dream matchup on Sunday. The stars are aligning for him to put up 20, even 30 points on both sites, and he comes at a lower price than you'd expect. The pick could be the difference between cashing in big or going home with nothing.